Friends. We found fall. Not the kind of fall we experience in Southern California, i.e. “iced” pumpkin spice lattes, “light jacket” weather, and approximately ten total trees changing color (and you have to hunt for them). Now, we were only in Boston for a total of 18 hours, but we did it well (and we’ll be back). We stayed at the Beacon Hill Hotel, located in the picturesque neighborhood of Beacon Hill. We LOVED this spot. 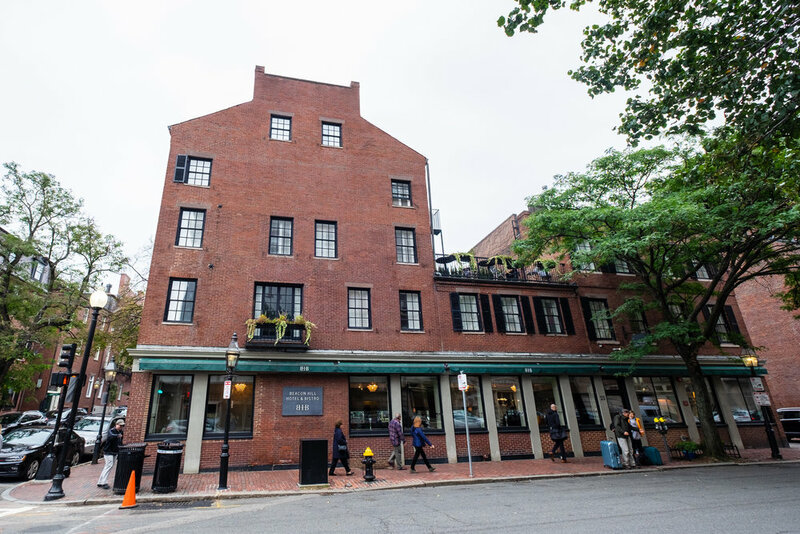 You’re surrounded by brick buildings with cute shops and quaint restaurants, plus the Beacon Hill Hotel makes you feel like a local. There’s only 13 rooms, so it has a quaint, homey feel. We ate dinner just a few doors down at Figs, a thin crust pizza bistro that’s equally cozy as it is good. Order the Red Sox pizza and a glass of Octoberfest beer, and you’ll thank us later. Follow that up with a drink on the rooftop (bundle up!) at the Beacon Hill Hotel, and you’ve got the makings for a perfect night in the city! The next morning we had breakfast at the hotel (get the breakfast sandwich), then ventured out to explore the city! This is Boston’s most photographed street, and it’s steps from the Beacon Hill Hotel. Get there early (like we did) and you’ll bypass the crowds! Next up, Walk the Freedom Trail! Right down the street from Paul Revere’s house is Mike’s Pastry, world famous for their cannolis and decadent baked goods. We had no self control and ordered numerous things - and they were all amazing. Especially the cookies. We closed out our 18 hour Boston sprint with coffee at George Howell. Not only do they have great branding (something we’re suckers for), but they have fantastic coffee. The baristas are well-trained and serious about what they serve, and the quality proves it. If you go in the fall, be sure to try the Hot Buttered Cider! Just two hours from Boston is Kennebunkport, Maine - our final destination. The drive to Kennebunkport is sprinkled with gorgeous scenery, cute seaside towns, and what seems like an endless amount of lobster shacks. It’s every bit as dreamy as it sounds! We stopped at Bob’s Clam Hut in Kittery for a lobster roll, fish chowder, and their famous “Fishwhich”. All of which were mouth-wateringly good. If you’re a seafood lover, this is your heaven. Because of our late start out of Boston, we got there around 2pm and there was no line. From what we hear, lunch can be crazy - so take note! Next stop was our “home” for the next three nights, the Inn at English Meadows. This charming B&B completely changed how we view B&B’s (more on that here). It was the perfect blend of cozy and luxurious, and the hospitality and attention to detail that the Innkeeper Elizabeth showed us was unparalleled. We had the “Carriage House Suite” which included a living room, kitchenette, private balcony and walk-in closets. It was like our own private casita - and we can’t imagine staying anywhere else! We walked to dinner at Old Vines Wine Bar, a welcoming little wine bar that specializes in tapas, wine, and specialty cocktails. Three of our favorite things! If you go, make sure to order the meatballs! We woke up early the next morning to explore the town of Kennebunkport, and we were so glad we did. We basically had the town to ourselves! We grabbed coffee at Mornings in Paris and Dock Square Coffee House (yolo!) and oo-ed and awe-ed over the picturesque buildings and town square. We enjoyed a delicious breakfast back at our inn, and headed out for a drive! We were on a mission to find the best fall foilage - and we figured the best way to do so was to explore the old country roads. Sure enough, we were quickly surrounded by colorful trees and farms that looked like they were out of a storybook! We embraced not having a set schedule, and stopped numerous times for photos, leaf frolicking, and...apple picking! Located on Bridgetown Road, Five Fields Farm is an apple picking dream. They hand you a bag, explain the different varietals, and point you to the fields. The trees are dripping with the juiciest, crunchiest apples we’ve ever had, and picking them was SO much fun. This is a must-do if you’re in Maine in the fall! We slowly meandered back to Kennebunkport, where we relaxed at our inn before going out for the night. We had drinks at a local favorite, The Pilot House, and then dinner at the newest (and coolest) restaurant in town, The Boathouse. We’re still dreaming about their lobster mac n’ cheese! Our final day in Kennebunkport was spent exploring. We stopped at Snug Harbor Farm to pet their mini horses and walk around their stunning farm. And then we made our way to Ogunquit, where we walked the famous Marginal Way path along the ocean. Conveniently, it led us straight to Barnacle Billy’s, where we had the best Lobster Roll of our trip! (Make sure you order the rum punch, too.) We sat along the water and watched the sailboats pass through. The view, the weather, the lobster roll… it all was too good to be true! The rest of our day was spent shopping in Kennebunkport and enjoying a leisurely happy hour at Stripers Waterside Restaurant. It was the perfect way to close out a perfect (and too short!) trip to New England. We can’t wait to return.